This site is copyrighted. Please don't use any of the materials here without my permission. 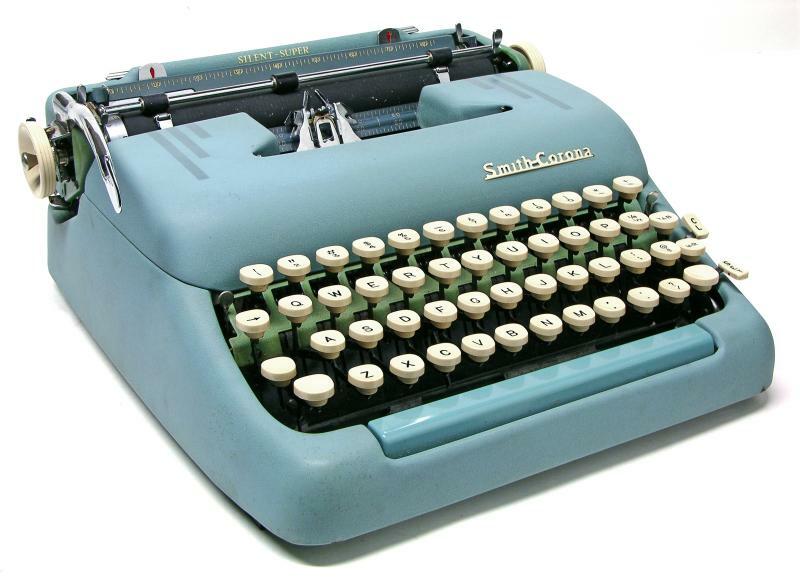 See here for a quick-reference guide to Smith-Corona portable serial number prefixes. It's debatable whether to include this full-keyboard upstrike here, under the Remingtons, or in a class by itself. Although the first typewriter built by the L.C. 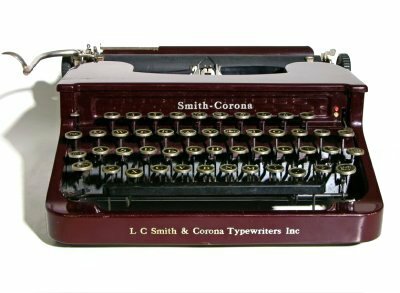 Smith & Bros gun factory that would ultimately give rise to the legendary Smith-Corona line, the Smith-Premier Typewriter Co and Smith-Corona were not corporately related. It was invented by an L.C. Smith & Bros employee, Alexander Brown, who felt he could improve upon the Sholes & Gliddon. 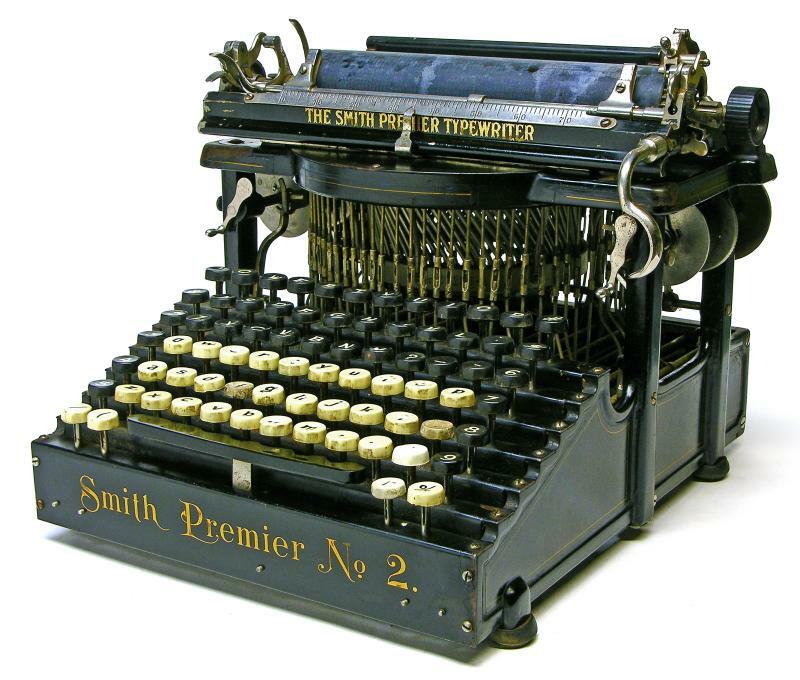 After the company folded in the early 1900s, the Smith-Premier name was purchased by Remington, which continued to sporadically apply the name to their own machines. Since this machine was born in L.C. Smith's factory, and presumably was the stimulous for them to enter the typewriter business later on, I'm going to catagorize it here, as the grandfather of all things Smith-Corona. Notice that the No.1's ornate, nickel-plated sides are gone, replaced by plain, pinstriped sheet metal. The strange double spacebar arrangement has also been consolidated down to a single, centered spacebar. Although both of these #8s were built prior to L.C. Smith's merger with Corona, both bear the L.C. 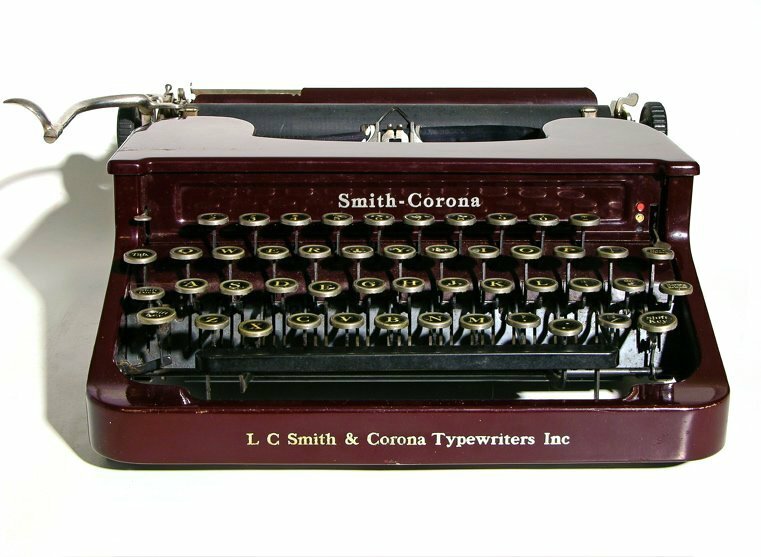 Smith & Corona Typewriter Co. name. This is because they were rebuilt after the merger and given new decals bearing the new company name. Just an example of how appearances can be deceiving. 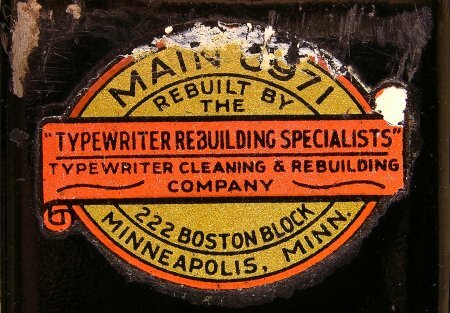 The top machine was actually rebuilt at least twice: once by the Typewriter Cleaning and Rebuilding Company (housed in the same Boston Block suite that was once the club room of the Minneapolis Chess, Checker, and Whist Club), and again by the American Typewriter Co (now a Chinese restaurant). At some point, it ended up being sold to the father of a teenage girl at a shop in Rochester, MN. This little cutie's platen folded down and over the keyboard to fit in its case. With over 700,000 built between 1912 and 1940, it was and remains a very popular machine. 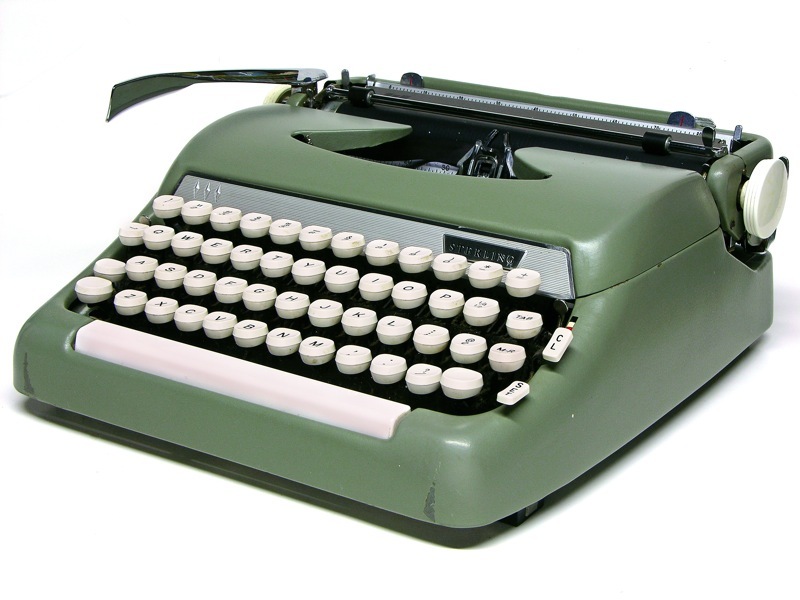 It was frequently copied by competitors, resulting in a number of patent infringement lawsuits. 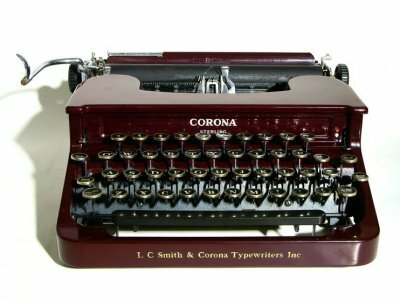 When the #4 was introduced in 1924, Corona began offering $50 rebates on the #3 and produced a line of Specials which came in red, green, and blue. There are several minor variations of the #3. 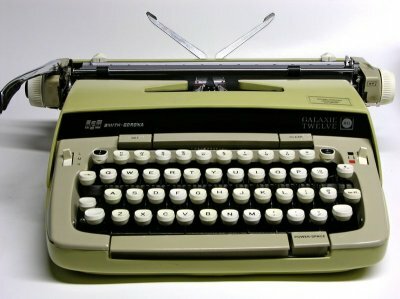 The very earliest have individually hung typebars, while later ones (such as the one above) have a traditional slotted segment. 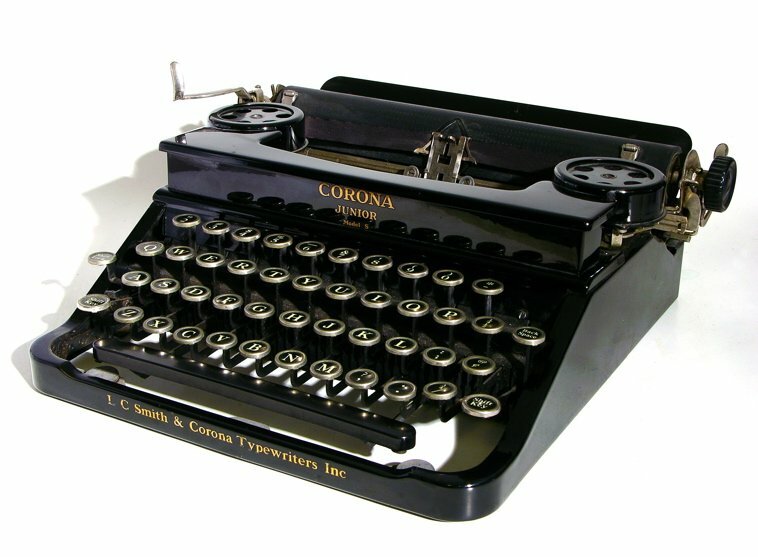 Very very early ones are labeled Standard Typewriter Company, as the company did not change its name to Corona until 1914. 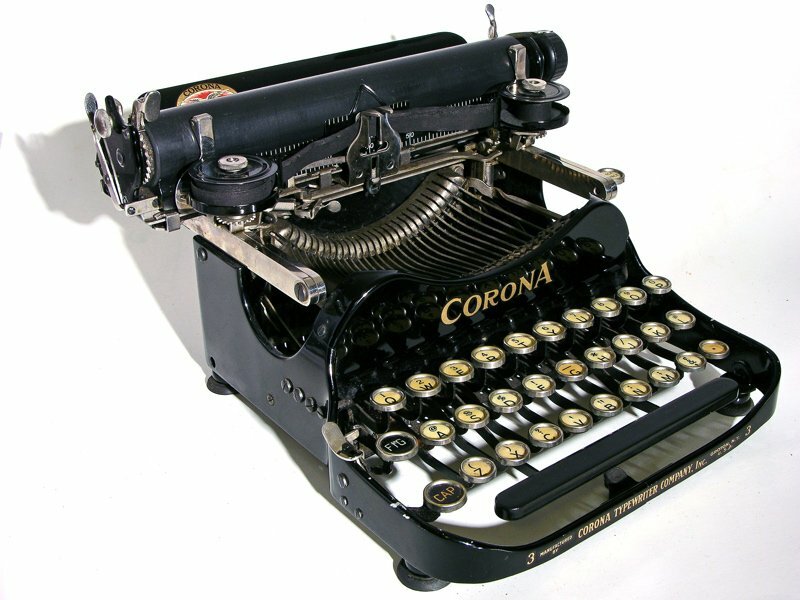 Around 1923, the "Improved" #3 added a set of right-hand shift keys and a widened platen. The Improved model also did away with the "3" designation on the front. The very last iteration, the one that may be of most interest to the collector besides the pre-1914 model, was the X-C / XC-D model. 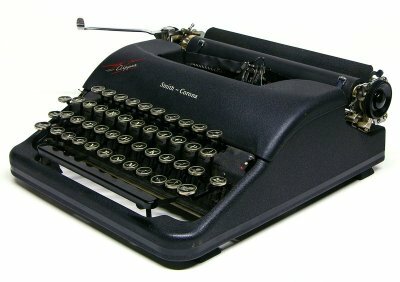 The X model added two more keys, for a total of 30. The X-C allowed the operator to configure any one of four special keys to be "dead" (striking a "dead" key does not move the carriage), and the XC-D came with all four of the keys dead by default. It may be a vey "common" machine, but its ingenious design and historical significance should give it a place in every typewriter enthusiast's collection. 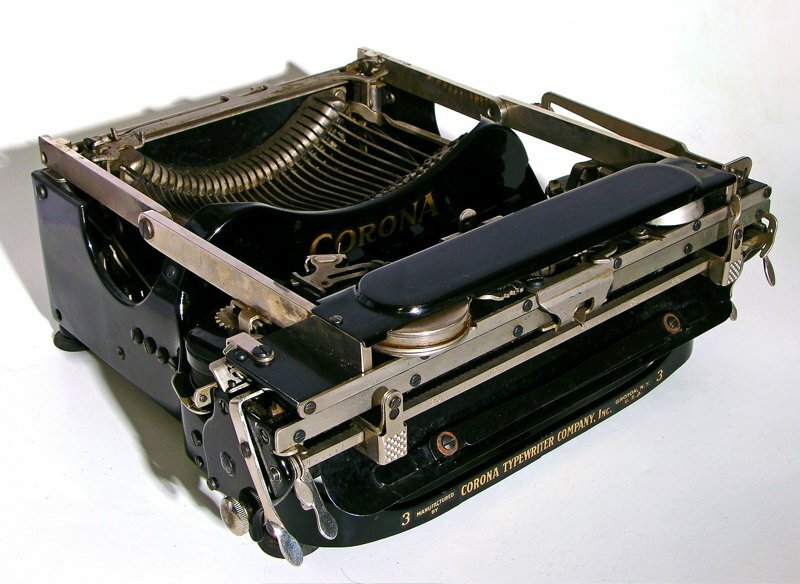 1924 was the first year of production for the Four. Either this machine was made before the company's merger with L.C. 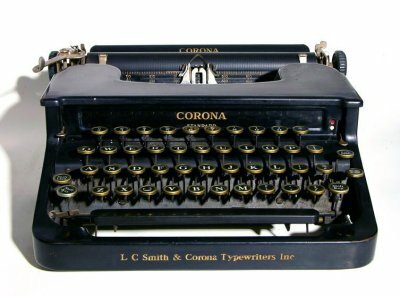 Smith, or machines continued to bear the old Corona Typewriter Company label for a short time. 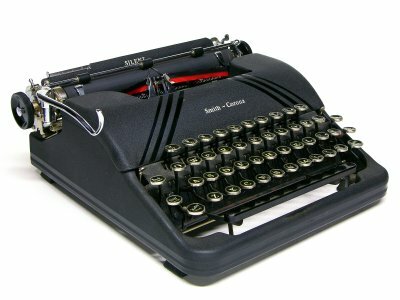 Download the manual for this typewriter here. 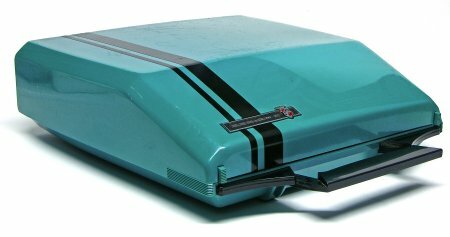 Both Corona Fours and Corona 3 Specials were available in at least 12 different DuPont DUCO color schemes. This one is in Channel Blue. Shannon L. Johnson has an excellent page on DUCO Coronas. Smith-Corona introduced the new "flattop" design in November, 1931 with an unprecedented promotional campaign. More about that in a bit. 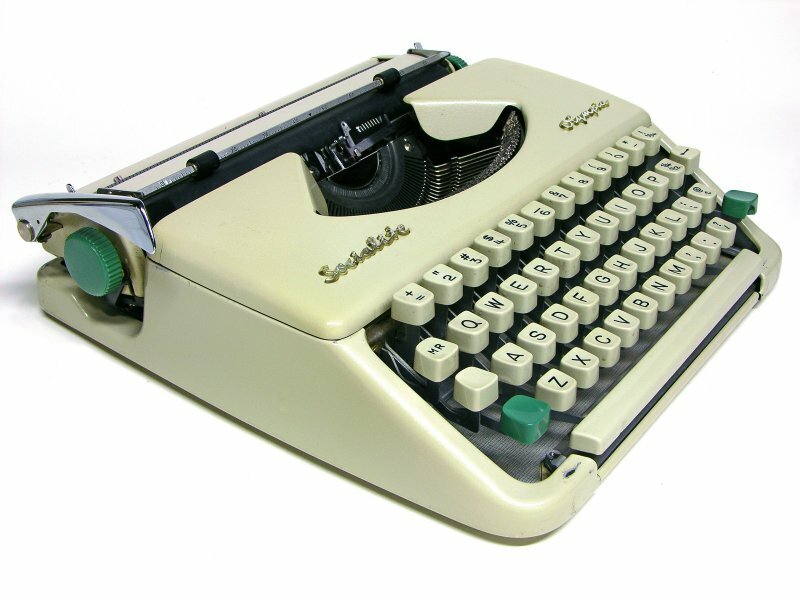 These very early versions have a medallion of the Smith-Corona logo embedded in the ribbon cover, and the ribbon cover itself is completely removeable. By 1933, the medallion had been omitted and the ribbon cover hinged in back, although the name remained generic for a short while. 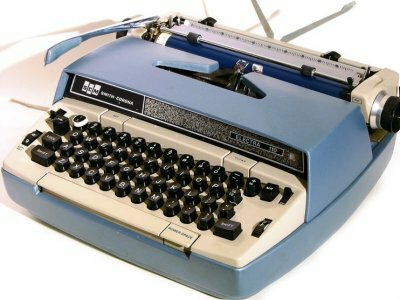 For the first few years, there were two versions, both called simply Smith-Corona, the only significant difference being that one had a tab feature and the other did not. They came in black, red, green, and, in a few special cases, silver. 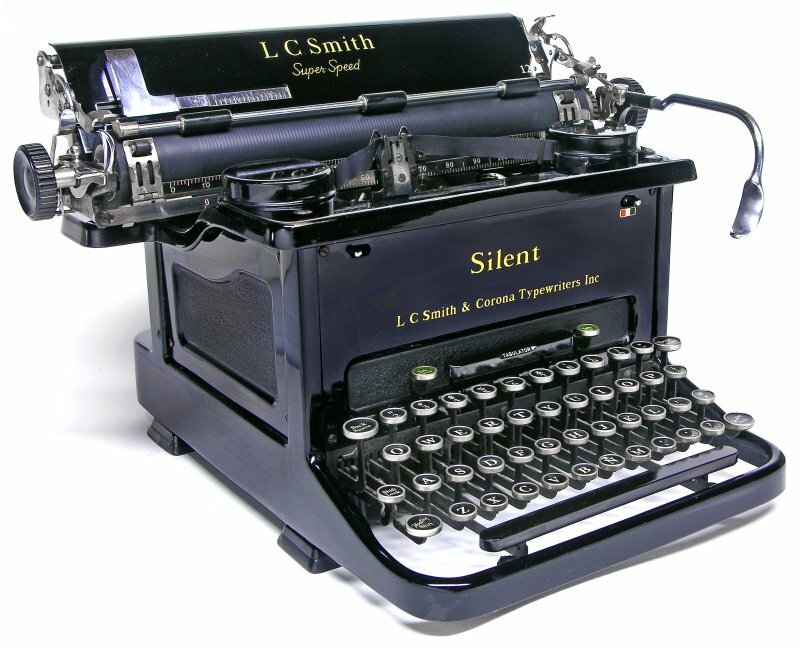 The name honored the first new portable produced after the 1926 merger of L.C. 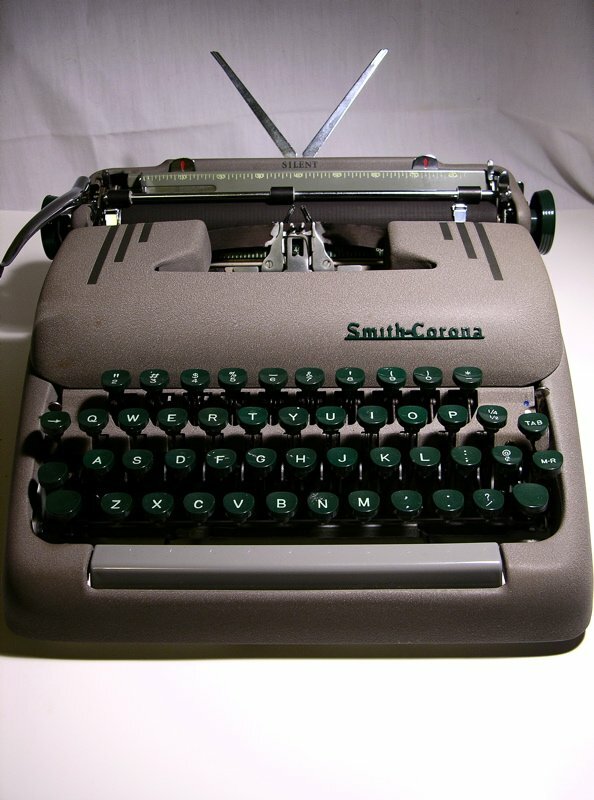 Smith and Corona and was designed to look like a combination of Corona's portables and L.C. Smith's standards. 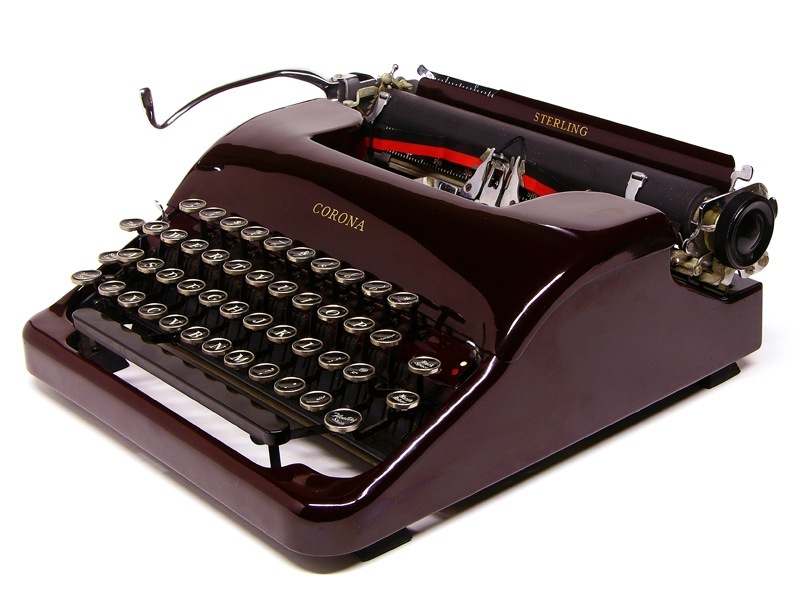 Though both versions of the model were officially known as the Sterling, in 1934 the tabbed and non-tabbed versions were split into their own models, the Sterling and the Standard. The company wanted to make a splash with their new Sterling model. They commissioned the Gorham silver company to jacket a limited number of bodies in sterling silver for a window display package for dealer showrooms. (Gorham also reportedly designed the special leather case for these that could double as a week-end bag.) 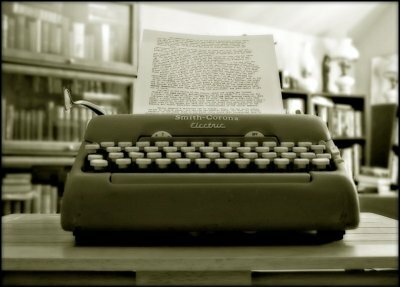 These displays would consist of the silver typewriter, a silver background screen of tin-foil and wood, display cards, floor covering, and a glass display case for inside the showroom. The package was available to dealers for $127.50, a good price considering that the silver machine itself was given a list price of $125 (about $1,750 in today's dollars). Initially, the typewriter and display were to be gold, but as they were designing the new model, countries began to drop the gold standard. At the same time, a run on Federal Reserve notes depleted the US gold reserves and created a panic in the banking industry. Gold was suddenly a lot less appealing. 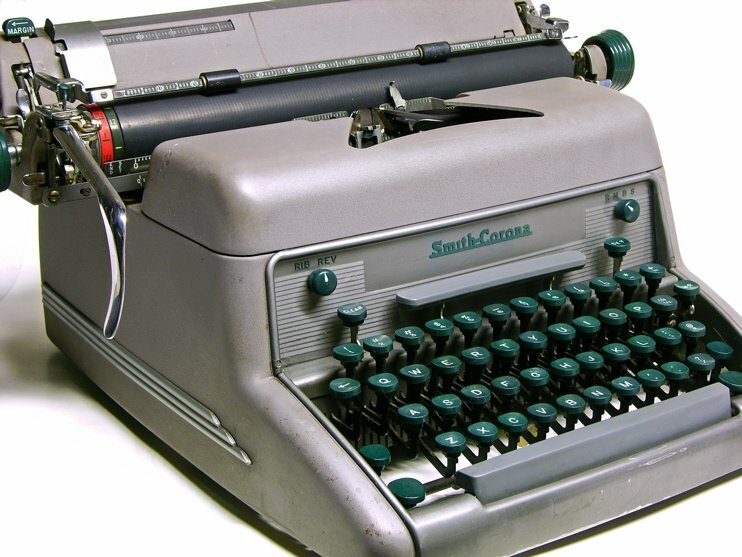 So Smith-Corona switched their scheme to silver. Initially, they planned for 175 silver models, but within two weeks of making initial contact with dealers across the country, the factory was swamped with 350 dealer orders for the display alone. 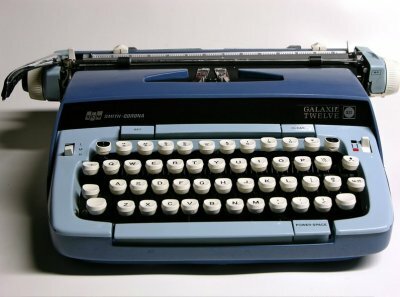 Evidently, the company adjusted their order with Gorham upward slighty, for a 1984 letter from James Sherrill, VP of operations at Smith-Corona, states that a total of 184 silver units were produced. So why have only a fraction of these already rare sterling silver Sterlings survived? Perhaps it was the rather mind-boggling selling point the company salesmen made to dealers to entice them to purchase the window display package. The wholesale price of the silver model, they pointed out, was about the same as the list price of the regular model ($60). If the silver unit did not sell, they could simply replace the silver housing with a regular one and sell the machine at normal price, then take the silver body to a silversmith for the market price of the silver and recoup most of the cost of the display! It's likely that many of the silver bodies were melted down. That also means that there may be regular-looking flattops out there with "S" serial numbers that once were silver! A variation of the early flattop model I call the "Proto-Sterling". The ribbon cover medallion is now gone and the cover itself has a fixed hinge in the rear. 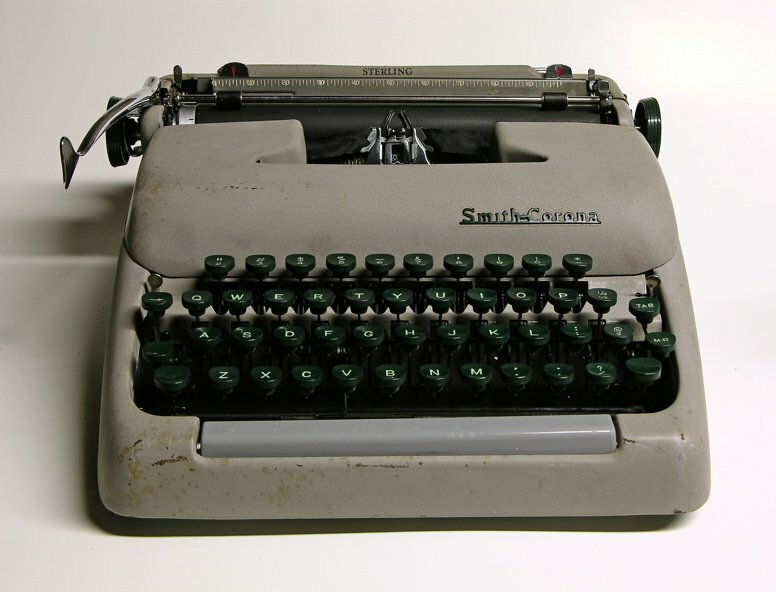 This tabbed version of the Smith-Corona would be christened the Sterling the following year. The Four Improved sold for $45. The basic model we saw earlier, now with a name: the Standard. 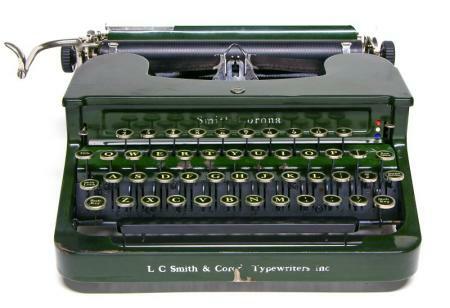 A low-cost portable for the depression era, the Junior was made from 1934-1940. 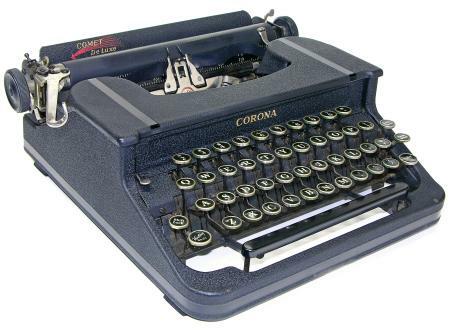 It shared the same housing as the Corona Four Improved, but lacked most of the Four's features. 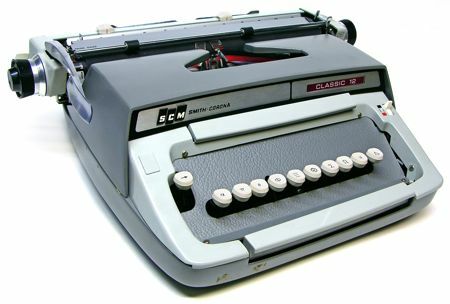 It has no left-hand platen knob, carriage centering lever (though the centering device is there and can be engaged manually) , ribbon selector switch, paper alignment slider, character scale, backspace, or margin release. In 1937, the Model S was added to the line. Virtually identical to the original Junior, the Model S features the addition of a Back Space key. 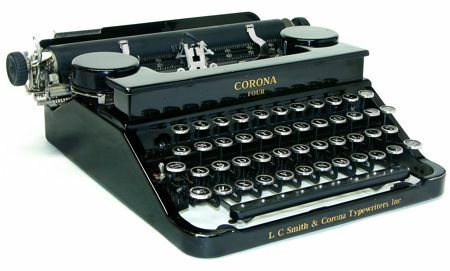 The Super-Speed Silent was the top-of-the-line model for Smith-Corona in 1938. Behind the body panels are heavy slabs of sound-deadening felt (it's still pretty loud). Note the right-hand carriage return lever. 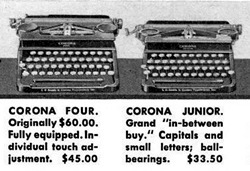 From the early '20s, Smith-Corona offered its standards with either left- or right-hand returns. It's very unusual to see a right-hand return installed as late as 1938. 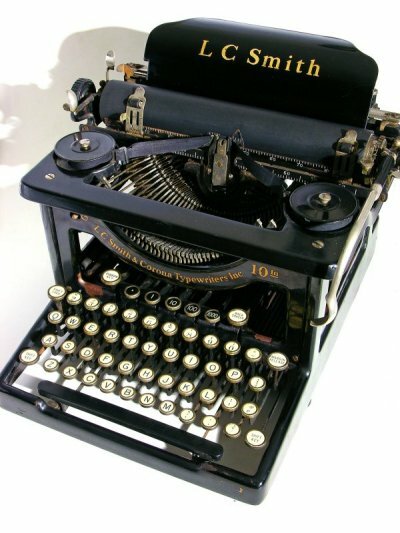 There are also two brass stops installed beneath the period and comma keys. The stops allow the keys to depress barely far enough to kiss the paper. I've heard of others having these stops, and I think it must have been an improvised solution to the problem of those two keys punching through the paper. It's likely that this typer came from the old Winona, MN, courthouse, as its previous owner was a legal secretary there from the 1930s until the 1950s. 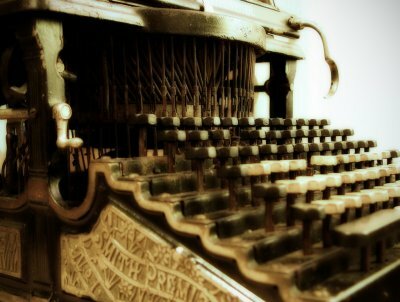 This was a teaching typewriter. All of the letter keys are blank, so the student would have no choice but to memorize the keyboard layout. The blanks, however, are just black plastic or celluloid inserts; the letters are present underneath. The inserts have cracked and come off of a few of the keys, revealing the letters. Remember I mentioned the unusually late right-hand return on the Super-Speed Silent above? These two Super-Speeds were manufactured very closely together, probably only about 2 1/2 weeks apart in late 1938 (Nov?). Just goes to show that you can't assume anything about production standards for any particular period in time. 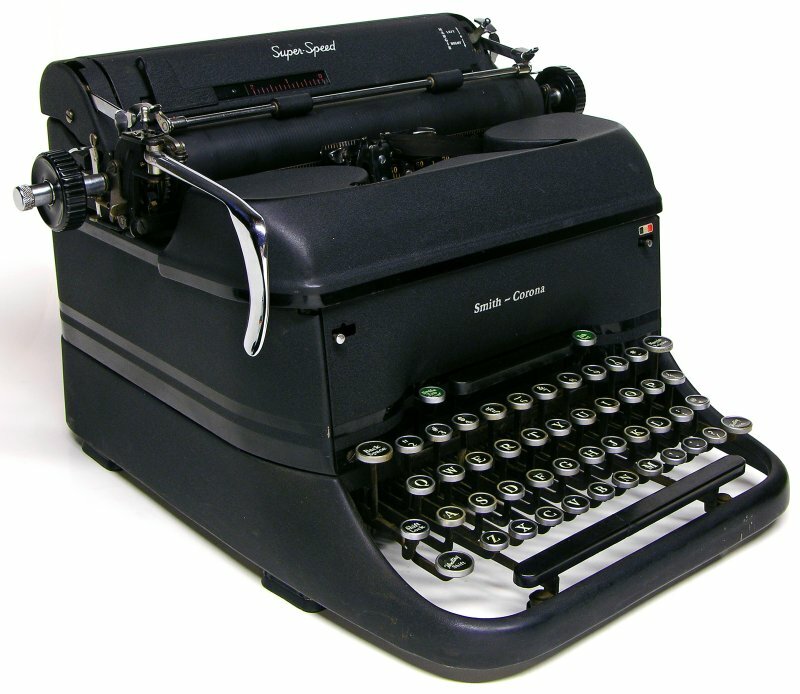 In 1939, Smith-Corona's "Flattop" style portable was replaced by the sleeker "Speedline" design. The Speedline somewhat belatedly reflected the futuristic, organic Art Nouveau style that had begun to move from architecture into industrial products in the 1930s. Speedlines continued through 1949, after which they were superceded by the Super-5 body. I have a theory that all 1939-1941 Speedlines came in either gloss black or red, and that any that are found in this "crinkle" paint were rebuilt and repainted. I base this on 1) the fact that every Speedline built for the government during WWII (and all S-C portables built during the war were for the US government) and all post-war speedlines were finished in "crinkle" paint; and 2) a chip in the paint on the back of this machine reveals the exact same dark red gloss finish as the Sterling pictured below. On a personal note, this is one of my favorite typers, both to look at and to use. The Comet is interesting because it marks the very end of the flattop body style that began a decade earlier with the Sterling. 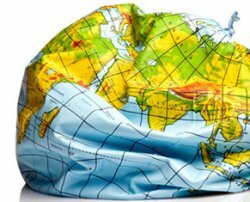 At this point, the flattop has been reduced to an economy typer. It looks a lot like the Standard, but even further stripped down--practically a Junior in a grown-up body. Notice that the side panels are completely flat and that there is no ribbon color selector. 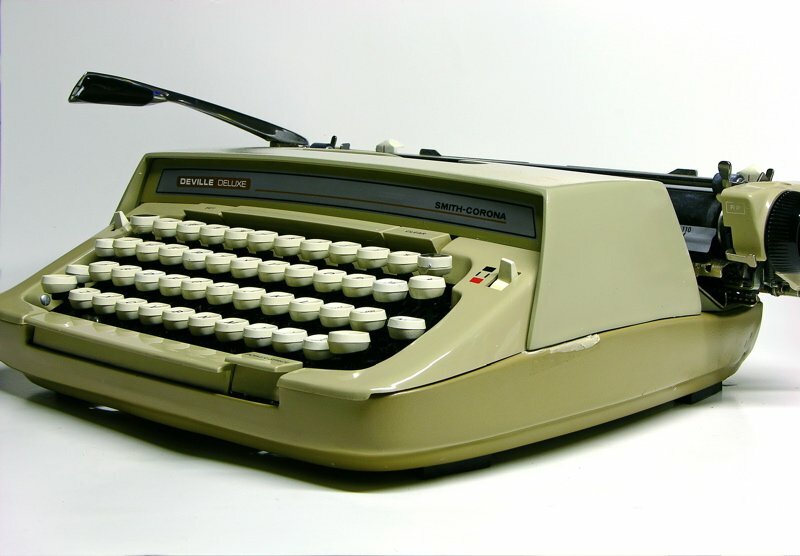 Backspace and Margin Release are its sole conveniences--and this is the DeLuxe model! About Comets (non-DeLuxe): as near as I can tell--for I've never seen one in person--the non-DeLuxe Comets have the same black crinkle finish, with no stripes, and no logo on the paper tray. They say only "Corona" on the front. A 1W serial number prefix should identify these as Comets. 1W appears to have been reserved for Comets and 1N for Comet Deluxes. About 15,000 Comet and Comet DeLuxes were made altogether, although I don't know how the total is divided between them. The regular Comet was made from 1940-41 and the Comet DeLuxe in 1941 only. 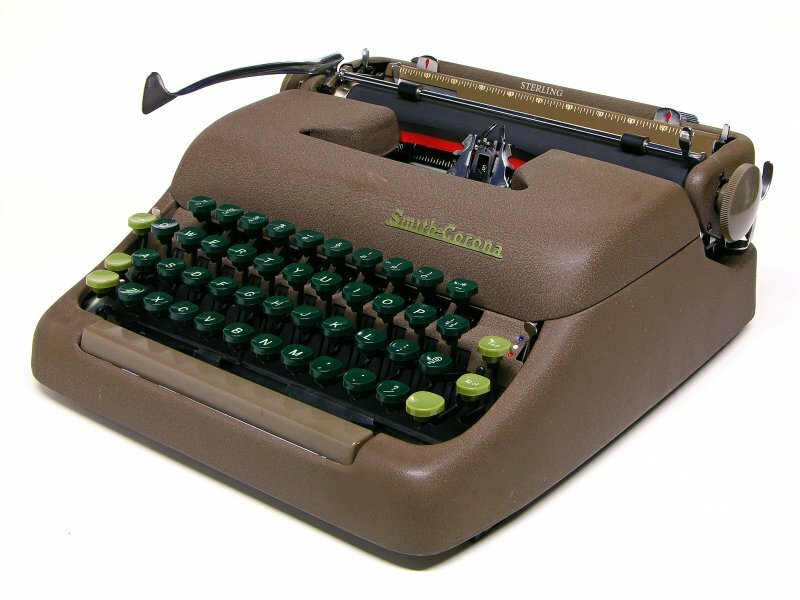 Smith-Corona resumed production after WWII with their product line mostly unaltered, except that the pre-merger "Corona" name has been dropped in favor of the "Smith-Corona" brand. The line of portables was also pruned to three: the Silent, Sterling, and Clipper. 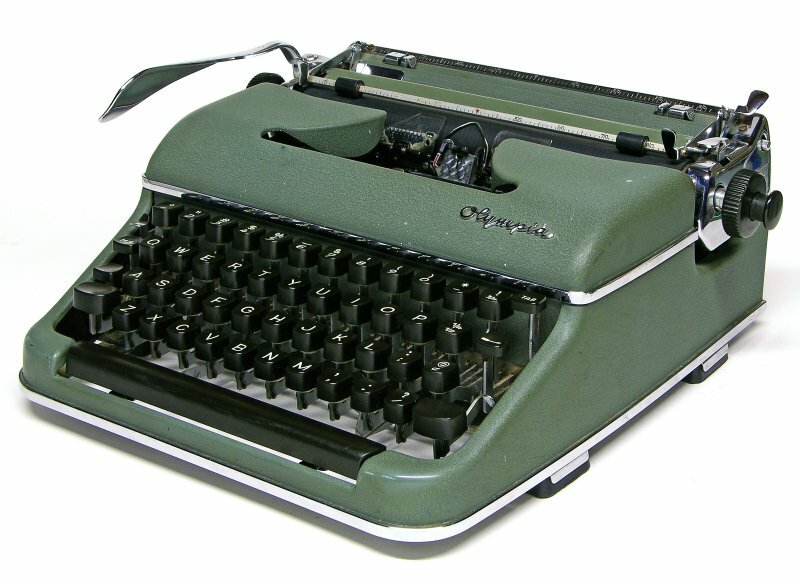 According to the serial number, this particular late-'40s Clipper was among the last of the Speedline bodies to roll off Smith-Corona's assembly line. However, as we've seen, Speedlines continued to appear sporadically well into the 1950s. The Clipper seems to have superceded the Standard name in 1945. Note the logo, which depicts a Boeing B-314 flying boat. Although the ubiquitious Pan-Am Clippers had been retired from service in 1946, the airplane continued to--and to an extent still does--symbolize travel in style and grace. The Super-Speed got a makeover in late 1939, just 2 1/2 years after coming onto the market. 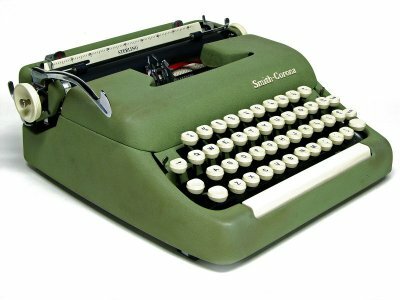 Though always seemingly ahead of the design curve with their protables, Smith-Corona lagged a bit when it came to its desktops. The original Super-Speed still strongly resembled the L.C. 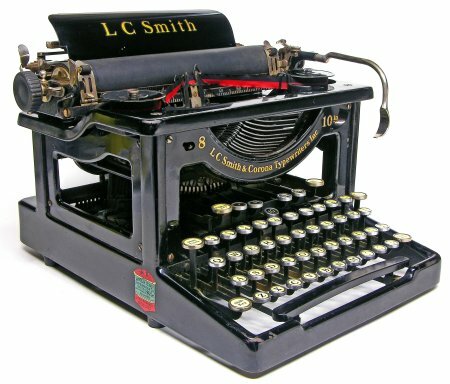 Smith body style begun in 1904, and the L.C. 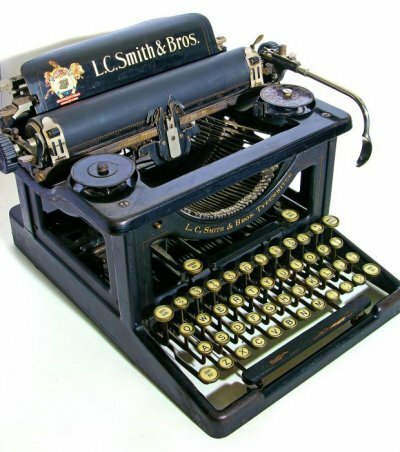 Smith & Bros company stubbornly clung to its naming convention of "L.C. Smith" on standards and "Corona" on portables until after WWII, when all models adopted the Smith-Corona badge. In my mind, this version of the Super-Speed belongs more to the '30s than the '40s, yet it continued into the early 1950s. 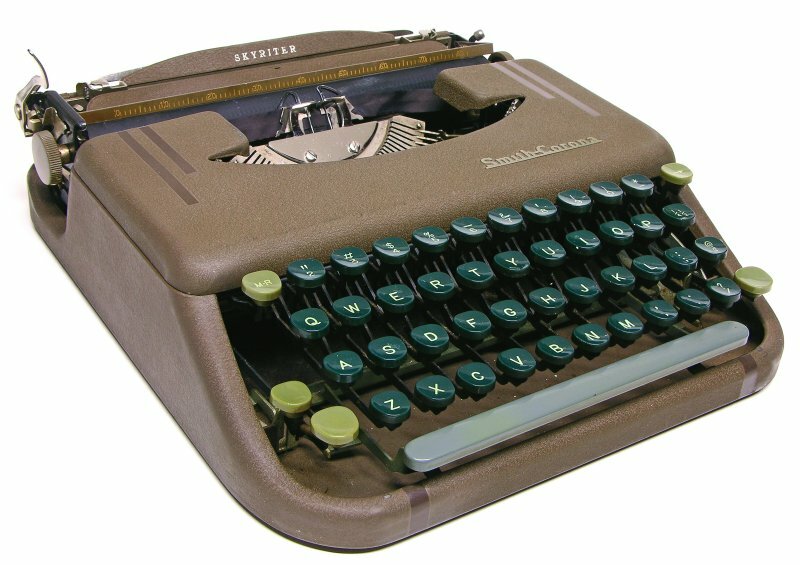 The final version, probably introduced late '40 or early '50, was available in tan as well as black, and featured the same two-tone green keys as the rest of S-C's product line. A new model, the 1951 6A, was a partially new design, the main alteration being the change to a slotted segment. 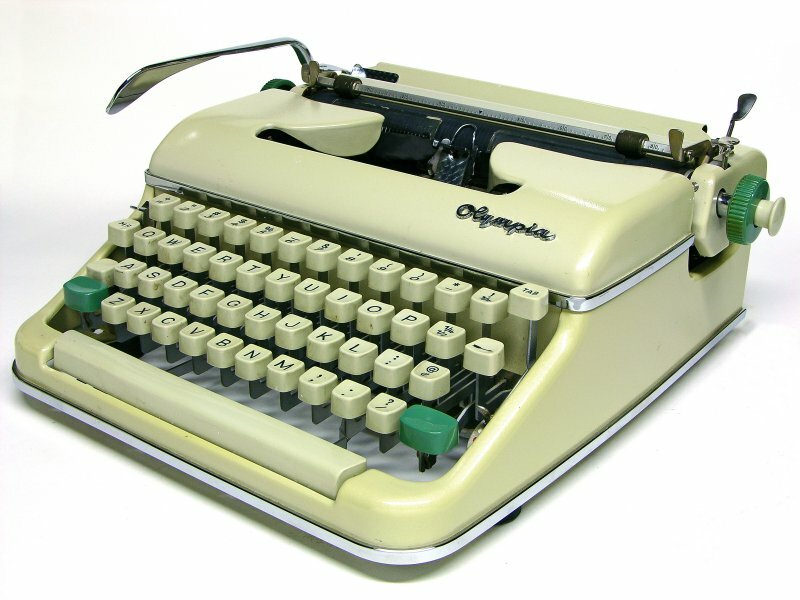 Up until then, Super-Speeds still operated with the individually ball-bearinged typebars that had been used in L.C. Smiths for almost half a century. It's unclear whether the Super-Speed line was completely discontinued in 1951 or if it continued to be manufactured on a limited basis in parallel with the 6A, 7A and 88 lines. When Smith-Corona debuted an entirely revamped line in 1949, among them was a brand-new model, the Skyriter. The Skyriter wasn't entirely brand-new; it was essentially a revamped Zephyr (a fact further alluded to by its 2Y serial number prefix; the Zephyr's had been 1Y). Culturally, the Skyriter reflected the shift from long-distance travel by train to travel by airplane. Supposedly it was designed to fit beneath the seat of a typical airliner of the day. The first full year of the new Super-5 body style. 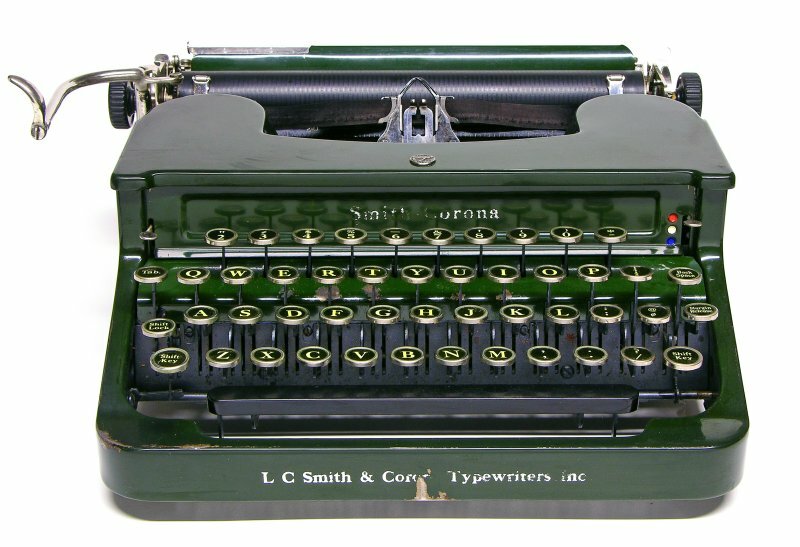 Note the lighter-green shift, tab, and margin-release keys unique to the 1949-1954 Smith-Coronas. This specimen must have been one of the first Smith-Coronas to feature a green plastic logo rather than the chromed logo. 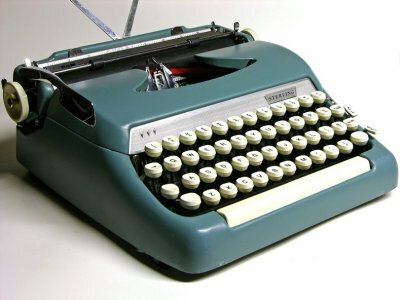 The Model 88 takes its name from the fact that it can type 88 characters (four more than previous models). 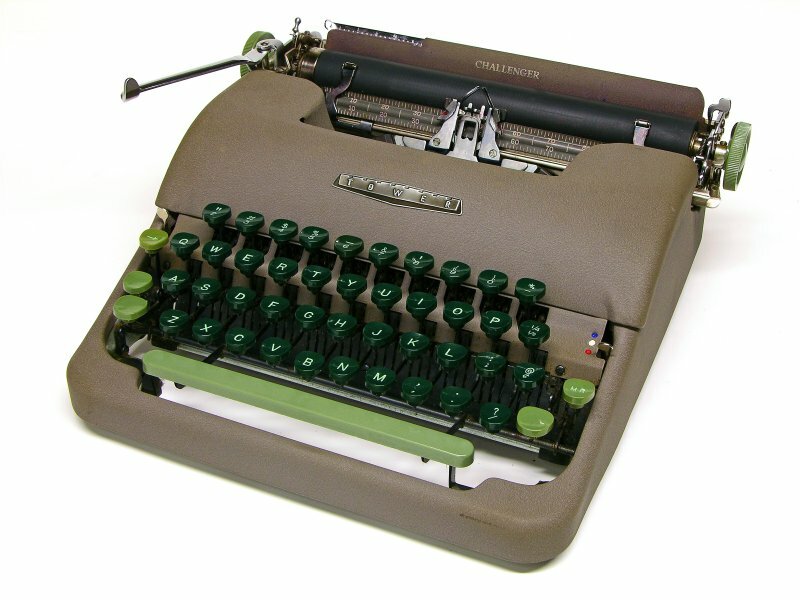 Besides the two additional keys, you can tell a Model 88 from the earlier Model 6A and 7A by its uniform dark-green keys (the 6A and 7A had the same two-tone green keys as early Super-5 portables). 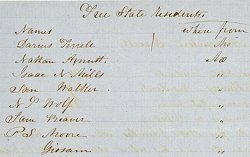 The serial # will also begin with the number 88. The E following the 88 seems to indicate the type pitch, though I haven't seen enough different examples to say for sure. 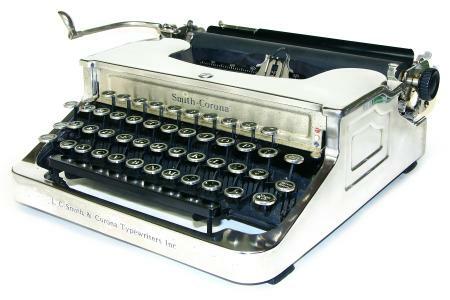 The Super introduced an extra pair of keys and keyboard tab controls. Within a couple of years, extra soundproofing was added and it became the Silent-Super. Just a (poor) example of a Sterling in the Diamond Dust color scheme. 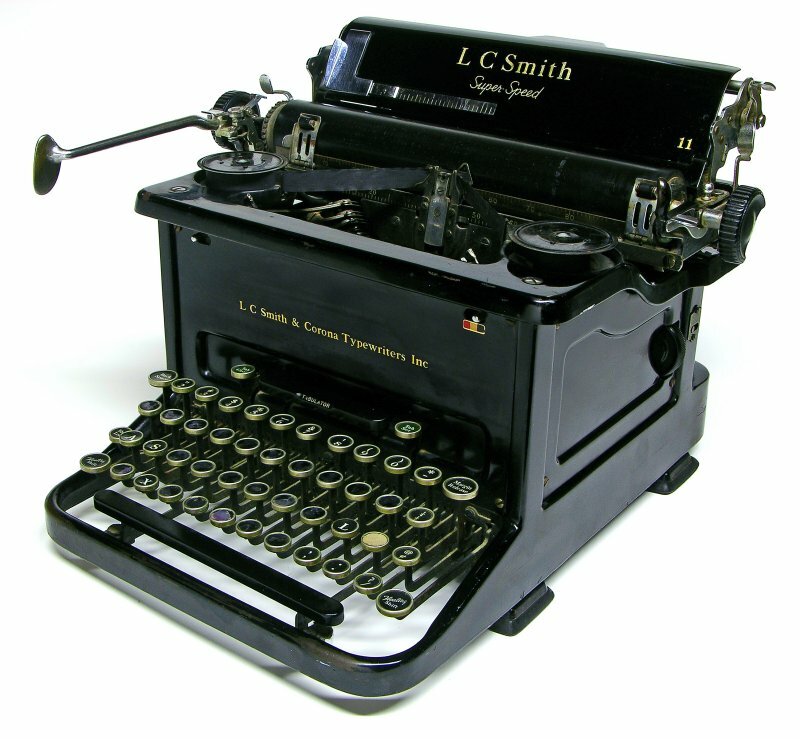 The 3Y series added a longer return lever. 1959 was the year that Smith-Corona introduced white keys. It was also the year that they introduced the new Galaxie body style (see below). The "Super 5" body style would last for a few more years, but this specimen was truly one of the last of its era. 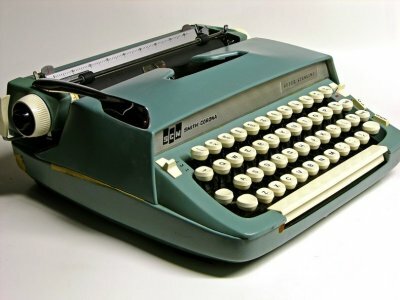 By the way, this is the "seafoam green" edition. 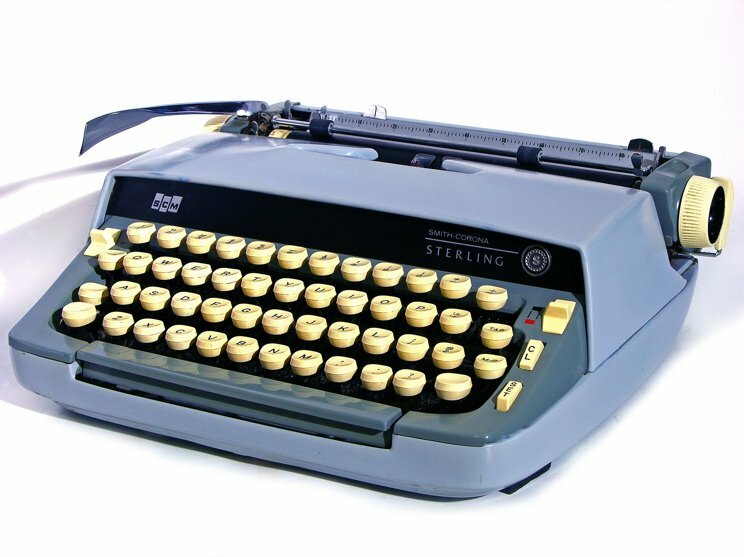 The X in the serial number signifies that the Silent-Super carries two more keys than the Sterling, Silent, and Clipper models. Note, too, the automatic tab controls at the keyboard's far right. Most later models in Super-5 bodies are simply variations on the Silent-Super, and the automatic tab controls are a clear giveaway. Known as the 5TE, Smith-Corona introduced the first successful portable electric typewriter in 1957. 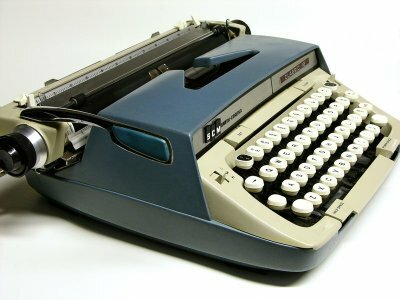 Properly, it's an "electric assist" typewriter, as the carriage return, tab, and backspace mechanisms are still manual. It looks to be a modified Silent-Super, of which we'll see another reincarnation below. Note that although this Sterling bears the "SCM" badge adopted along with "Galaxie" body redesign in 1959, its body is a 1950s "Super 5". Like the 5TE Electric, it's a Silent-Super under the hood. Remnants of the "Super 5" line can be found being made well into the first half of the '60s. 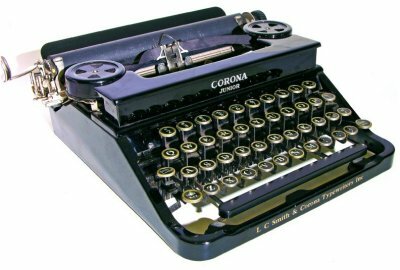 It's unclear why this was done other than possibly to offload leftover Super-5 housings by marketing it as an economy typewriter. 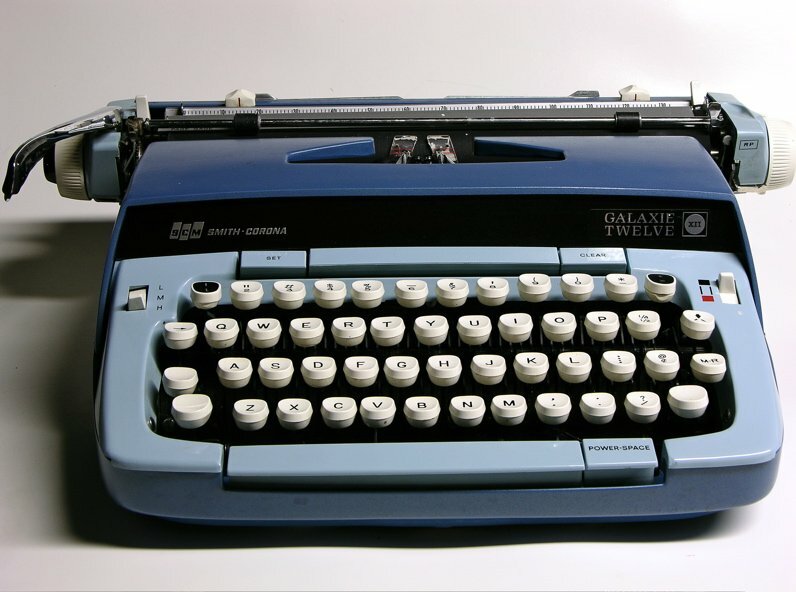 For all practical purposes, this is the original Galaxie with a 12" carriage and the addition of a half-space bar. 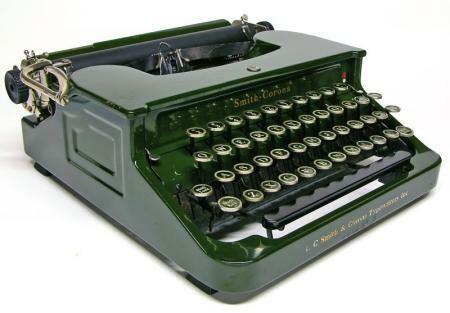 I believe this to be one of the models built by SCM's British subsidary British Typewriters. I'm basing the date upon the copyright of the manual included with the machine. Debuting in 1970, the Super G was an answer to Olivetti's Valentine. Designed by noted automotive designer Ghia, the Super G sports rubber tire treads instead of feet, racing stripes on the clamshell cover, and the Ghia logo. Mechanically, it's just a British-made late-model Skyriter with some additional features, like Power Spacing. Something that I have not yet seen brought up by other collectors is the idea that the Super G name may have a double meaning. On the surface, the G would seem to stand for Ghia. 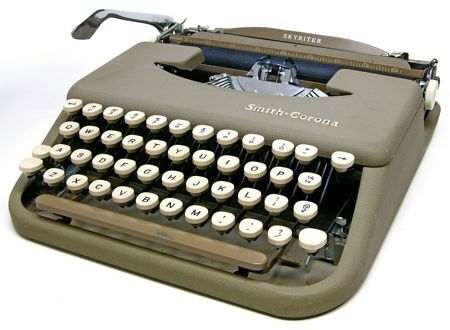 But given Smith-Corona's history of naming typers after trains and planes--Zephyr, Clipper, and the more generic Skyriter--I wonder if Super G is not a hidden reference to the Lockheed "Super G" L1049G Constellation. I personally think that it may be some anonymous designer's nod to the Constellation's designer, the legendary Skunk Works founder Clarence "Kelly" Johnson. If I were a young designer, I'd have idolized him, wouldn't you? This strange Classic 12 with a single row of Greek characters is a bit of a mystery. A handful of others are known to exist, but no one knows what their purpose was. 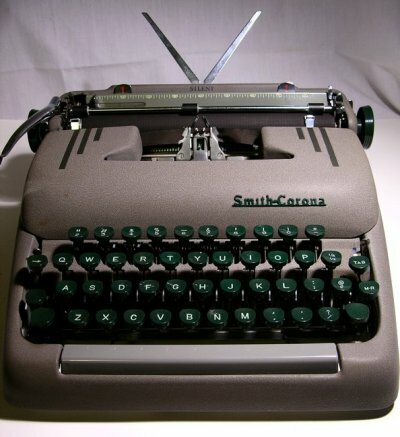 It's been speculated that they were demonstration units, used for typing fraternity and sorority names on forms, and for augmenting older typewriters whose users required mathematical and engineering symbols. No explanation completely holds water. (If a demo unit, demonstrating what? Frat and sorority names are always upper-case Greek; this has some lower-case letters. If to fill in math and engineering symbols, why are many commonly-used symbols missing? All of the other known units like this have the same serial number pattern of 100XXXH. At least one uses the Galaxie XII's 6MLC prefix. The "H" is a code for the manufacturing plant, but no one seems to recall which plant it corresponds with. The only clue to its year of origin is the label "Patented in Canada 1973". Its construction is bizarre. The tab bar is present, but not connected to anything. There are shift characters on some of the slugs*, but the basket does not shift. There is no margin release. Touch-control has been omitted. There is, however, a backspace. 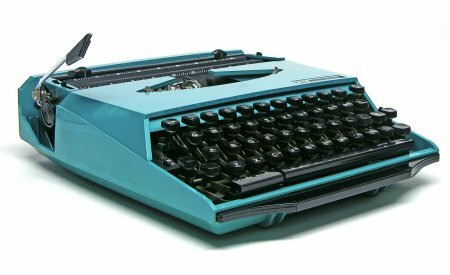 Until documentation turns up that explains why Smith-Corona went to the trouble to make at least a few hundred of these one-bank Greek typers, it remains one of a thousand little mysteries of typewriter history. * A, M, II, ~, two pi's, and a schwa. Leading syndicated humorists agree: "Two Pi's and a Schwa" would make an excellent name for a rock band. I've come to suspect that the Deville line were Galaxies sold through K-Mart. 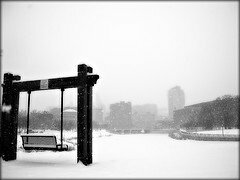 At the moment, it's little more than a hunch. 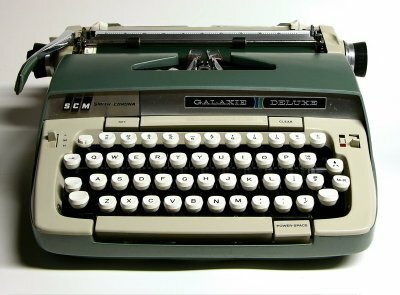 The 3rd-generation Galaxie from the 1970s had the rather unusual but attractive feature of colored platen rubber that matched the body. People often ask what the key with the downwar arrow and two diagonal lines above the Margin Release is for. That's an "unjammer", to release stuck typebars. It's more gimmick than practical. 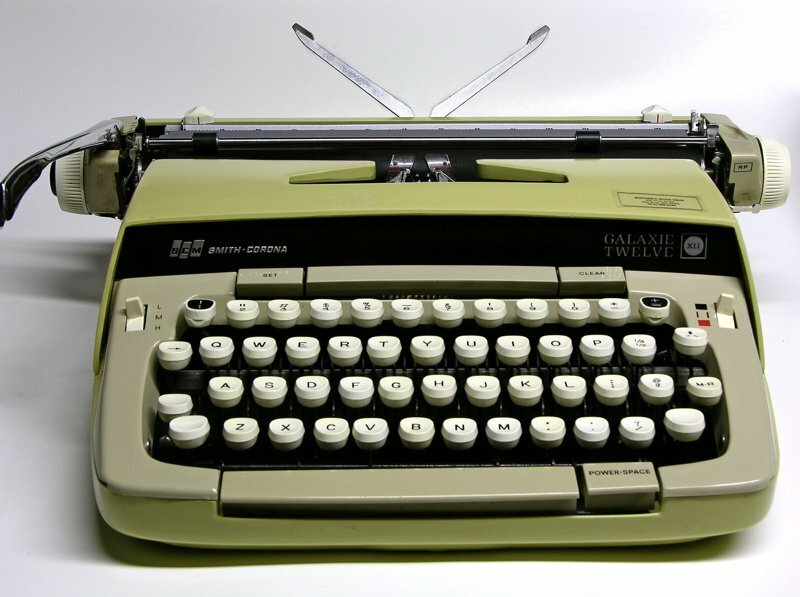 Galaxies from this era are splendid machines to type on, among the best from the '70s. 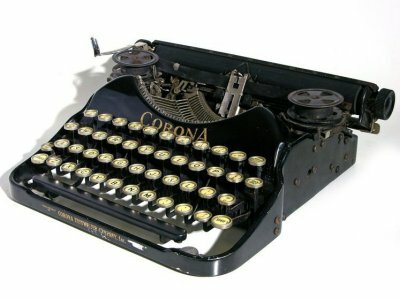 Note the black-topped keys at either end of the top row. These are Change-A-Type keys. 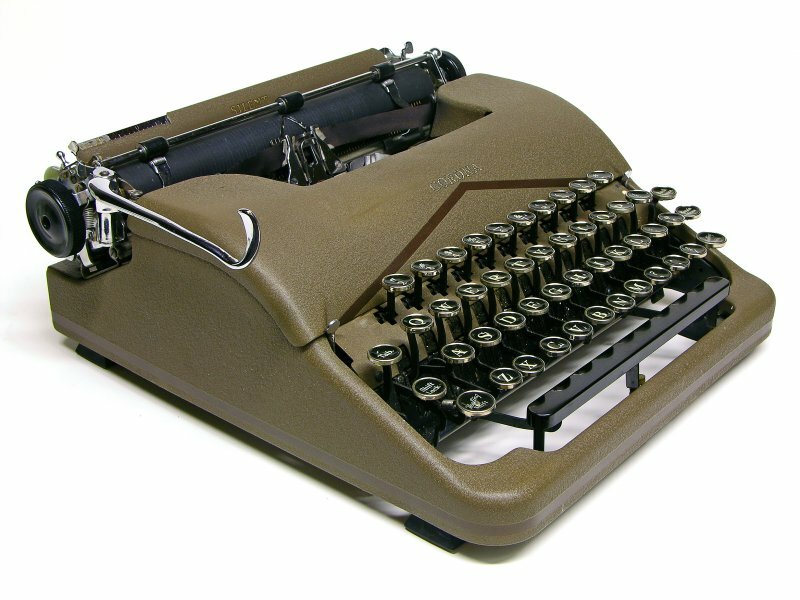 The key tops and typebar slugs were removable and could be replaced with a wide variety of specialized characters sold in sets of four. Some of the sets one could buy were Mathematical, Engineering, Popular Greek, and International. I've even seen Change-A-Type slugs with male/female symbols, Yin/Yangs, and happy/sad faces (the original emoticons!). 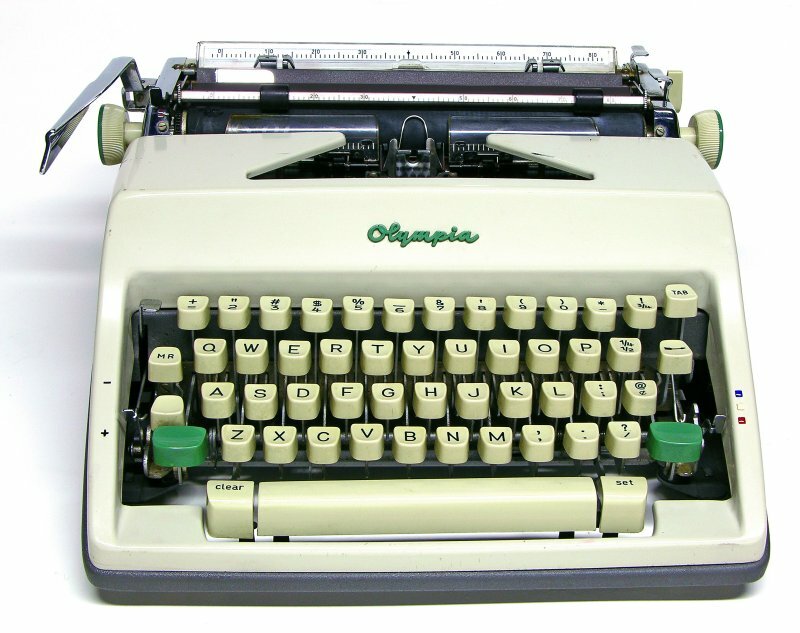 Machines with standard-length platens have one Change-A-Type key, and those with 12" platens have two. The bottom example is the "Sunburst Yellow" color scheme. 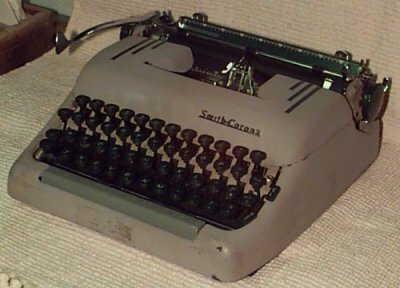 While electric typewriters don't generally interest me, it is interesting that this relatively late electric model still has a manually-operated carriage. 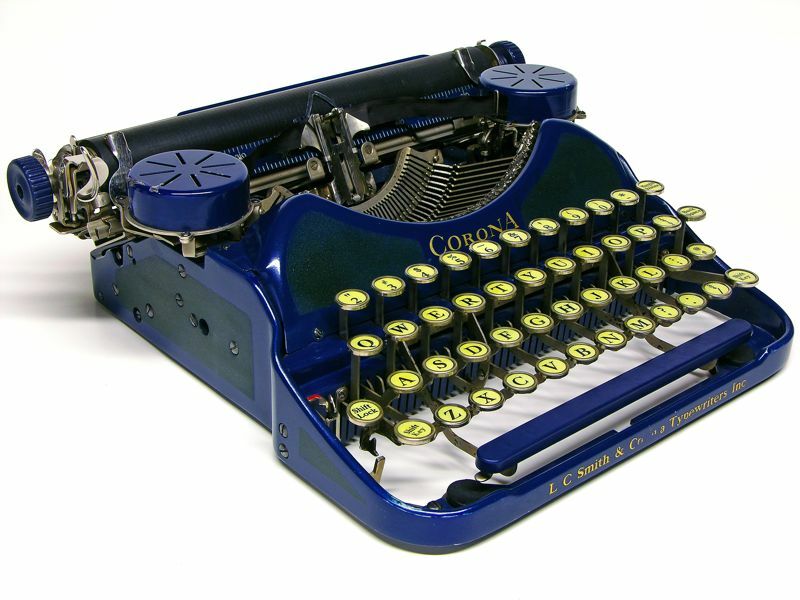 Note the blue platen and padded return.